Share the post "Majority of Ukrainians Are Proud to Be Citizens of Ukraine"
“The absolute majority of the Ukrainians (67%) are proud to be Ukrainian citizens. This number has been gradually increasing from year to year,” Iryna Bekeshkina, Senior Academic of the Sociology Institute, Director of the Democratic Initiatives Foundation, said at a press conference in Kyiv on August 21, presenting the poll results. According to her, 10 years ago 38% of respondents were proud of being Ukrainians. In 2005, this number grew to 53%. In 2013, the number of such respondents was 48%, and last year it grew to 61%. The survey was conducted on June 26 – July 18, 2015, among adult population of Ukraine (over 18 y.o) in all regions of Ukraine, except Crimea and the occupied territories of Donetsk and Lugansk regions by a personal interview at the residence of the respondents. 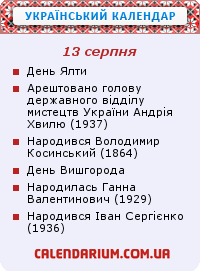 1,802 Ukrainians were interviewed. Sampling error does not exceed 2.3%.